One of the benefits of planning a vacation, is that you learn so much about a place even before you start from home. Seejo and I are of course not the “fly by the seat of your pants” vacation people. When I planned to attend a conference in the Big Island of Hawaii and decided to combine that with a short vacation with Seejo and the kids, the research began in earnest. And even before we landed in Hawaii, I learnt that Hawaiian archipelago consists of hundreds of islands with 7 main inhabited islands. Some of these 7 islands like Niihau has a population of only 170!. I also learnt that one of the islands , Lanai, is owned 98% by Larry Ellison (Oracle CEO). OF these the largest by area is the Big Island of Hawaii. I also learnt that Big Island has two major towns – Kona on the west and Hilo on the east ( the center). Population tended to be centered around the rim of the island, the central area was mostly volcanic national park. 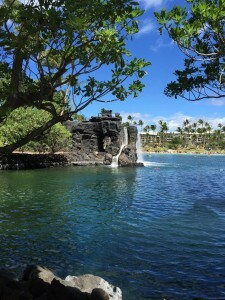 We were staying at the Hilton Waikoloa Village at Kona – a really nice & somewhat fancy resort, also the conference site. The resort was indeed a mini village with several restaurants, many pools catering to kids and adults separately, a sandy lagoon, dolphins and shark enclosures, beautiful seaside walks. In fact, it was so huge that we needed a tram (with 3 stops) to take us from the check in desk to our rooms. The best advice I got from the conference organizers was to stock up at the local Costco – which is exactly what we did the day we landed. We got water, kids’ snacks, diapers and some emergency food – so we didn’t have to spend mega bucks inside the resort. We spent the first day just exploring the resort and ended up at the very serene Buddha’s point at the far end of the resort, where a huge statue of Buddha looks out to the majestic ocean. 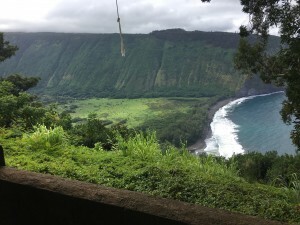 The next day we visited the Waipio valley. The valley is about a mile wide and about 5 miles deep and is surrounded on three sides by lush green cliffs that are about 2000 ft high. To get into the valley you can either enter by water on the fourth side or hike down a steep trail down the cliffs. Not being huge hiking enthusiasts, we opted to take a 4WD shuttle down to the bottom. There were a few small houses/shacks in the valley but it was apparent that most people (50 or so) who lived there also probably had another abode outside the valley and were primarily there just to farm. It was like going back in time where there were no shops, no schools, nothing except farmland. Wild horses roam freely, waterfalls cascade down the cliffs , streams crisscross the trail ; it is indeed a tropical paradise. The cultivated land at the base of the valley, is mostly utilized for taro which plays a huge role in Hawaiian culture and cuisine. The taro root is mashed and cooked into a viscous consistency to form poi , cut up and fried to form chips, the leaves are eaten as is or used to wrap around pork and is steamed. It plays an important part in Hawaiian mythology too. Legend has it that the elder sibling to the progenitor of the Hawaiian race died and was reborn as a taro plant. But I was really struck by the abundance and variety of plants growing in the valley, besides just the taro. According to our guide, who really knew his botany, flooding is common in the valley and there were some large floods that caused all of the plants to get mixed up and suddenly there were several varieties of plants growing in the valley. There was heliconia, red ginger, breadfruit, mango , jackfruit, cocoa, cashew, pineapples and more. For someone from Kerala, all of this including taro (we called it chembu) is incredibly familiar. My grandmother had most of these growing around our house in Kerala. But in addition to these plants, there were many that I hadn’t hear of – I bet there were people from some other part of the world going – this is just like home! 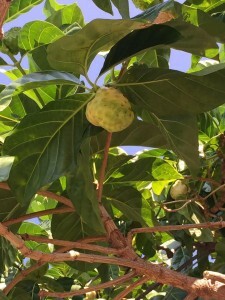 The weirdest one for me was the noni fruit – which looked like a lighter green custard apple but was the yuckiest smelling thing I have ever seen – it smelled like rotten garbage mixed with old socks. I attended by conference the next two days while Seejo and the kids enjoyed the resort, went to the lagoon and the pools and generally had a fun time. Tanay decided to walk for the first time, the moment we stepped into our hotel room, so he spent some time tottering all over the place. I skipped the penultimate day of the conference and we spent the day exploring the south west rim of the island, stopping at attractions like Pu’uhonua National Historical Park Hawai’i (sacred site which apparently acted like a safe zone for those who broke the laws (kapu) of ancient Hawaiian society) Even those not familiar with the park or the legend are familiar with these wooden statues of Hawaiian gods. The other nice thing was that the waters off the coast were teeming with colorful fish – we didn’t even have to venture out snorkeling to see them! And to make it more exciting, Hawaiian sea turtles meandered in from the sea and parked themselves on the beach within touching distance! We also stopped briefly at the painted Roman catholic church at Honaunau – a small colorful church with scenes from the Bible painted on all the walls before making our way to a small almost secluded private beach that the hotel recommended as being great for kids. They were right and the kids had a lovely time – This beach seemed like a kid friendly extension of the more famous Hapuna Beach – voted as one of the top beaches in the world. We also had the luau to go to before we left Kona complete with food , traditional hula dances, leis and a party atmosphere – well as much as middle aged radiation experts can get up to partying! Once the conference wrapped up, Seejo and I shifted base to the other side of the Island to Hilo. IT was then that we appreciated the geographical diversity of Big Island. One advertising brochure announced “Where else could you go snow skiing, walk to a lava flow, surf, snorkel, and visit a rainforest in the same day? “ Which was incredibly true. For a small island that took less than 3 hours to drive across , the island has 8 different climate zones. Now here is the astounding fact. The world has only 13 climate zones and 8 of them are on this little 4000 sq mile island (about the size of Connecticut or Tripura if you want an Indian state). Between polar snow, to arid desert to tropical rainforest – Big Island has it all. We drove across using the pretty islated Saddle Road watching the harsh barren black volcanic landscape of Kona transform slowly to verdant tropical paradise was magical. Here was another difference: Kona gets about 25 inches of rain each year, Hilo over 125. Keep in mind, that this is just a 2-3 hour drive away. Most jobs, hotels and tourists are in Kona whole most locals live in Hilo and commute. This is because most locals cannot afford to stay in Kona. Hawaii is expensive real estate to own! Our first stop in Hilo was for me – the definition of Hawaii. The Volcano National Park and boy! Did it live upto its expectation. 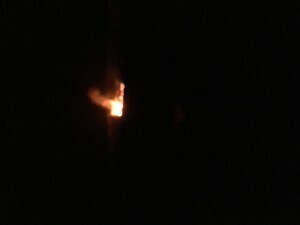 We went in at night – so we couldn’t really see the rim of the crater clearly but we could see the fire burning brightly – we were about a mile away from the rim of the active volcano. The guides informed us that people could drive much close before but there were sudden eruptions ( they mentioned boulders the size of washing machines being flung in the air) that caused the park rangers to restrict access. Kilauea has been erupting continuously since 1983, the volcanic triangular cone has long since collapsed within itself forming a wide caldera . 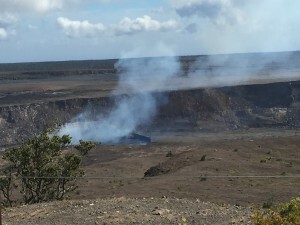 The lava seeps out from the sides of the caldera flowing across the island and falling into the ocean. Folks who have seen it hitting the ocean say that it forms sand on contact with the sea – instant land formation. We couldn’t hike that far to see it , so we had to be content watching the lave and the aftermath of the lava flow creating a black charred pathway wherever it lands. The volcanic national park consises of several of these calderas, some still smoking intermittently – somehow making it seem as though we are on another planet. I found it fascinating that people continue to live there – not knowing if the lava could be headed their way. The lava flows incredibly slowly – so unless there is a huge explosion, most people can save themselves but it could simply destroy any vegetation or property in its path. I was so mesmerized my this landscape that I insisted we visit again during the day time to get a different perspective. 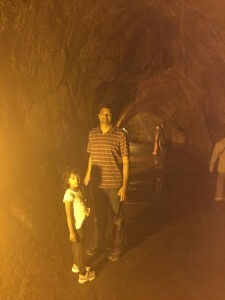 We also visited the lava tube – a sort of tunnel creating by lava flow many decades ago. Getting to the lava tube was via a 1/3 mile walk through a tropical rainforest complete with bird calls, colorful orchids, dripping ferns and then you enter this dark tunnel created by lava flow. Surreal! We had one more day in Hilo – which was busy. We got lost following the GPS while we tried to make our way to Akaka falls, winding our way through farmlands and then dead ending at a wooden gate where the (no doubt) irritated owner had put up signs saying this is NOT the way to Akaka falls. The Akaka falls by itself was not that impressive but the surrounding greenery around it made it a very pretty sight. This was the beginning of photography delights for Seejo. He got a whole bunch of pictures before we moved to our next destination – the Akatsuka Orchid gardens. Orchids of every color (including a rare black one), shape and size were displayed – It was just so pretty! Seejo’s camera got an additional work out as we was furiously clicking the flowers. From the Akatsuka gardens our next stop was the Mauna Loa Macadamia nut factory. We saw the macadamia nut trees on both sides of the road leading to the factory but the tour was largely self-guided and quite underwhelming. We could peer through somewhat hazy windows as workers essentially packed the nuts and shipped them. There was a little garden with several tropical plans and the kids got a chance to run around. We had a late night flight the next day back to DC and we wanted to make the most of it. It was Saturday – the Hilo farmer’s market was open , so we spent a good part of the morning visiting different stalls and sampling their wares. We bought some minor trinkets as souvenirs and ate our way through some of the stalls before loading up and starting the long drive back to Kona. 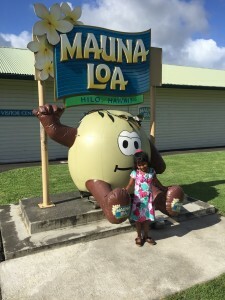 This time we decided to drive along the southern route and made a pit stop at the famous black sand beach at Punalu’u where the kids got to stretch their legs and play in the sand. On the other side was a huge field of water lilies whch was just a contrast to the black sand! After dragging the kids back to the car , we drove down the coast line, enjoying the beautiful scenery till we reached Kona. I have to mention Hawaiian food. We had poke (pronounced pokay) every single day . 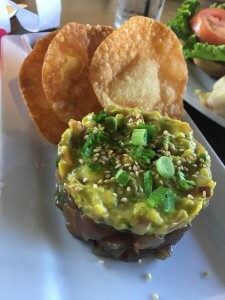 Poke is raw tuna fish cut into small cubes or slices and flavored with different seasonings such as soy sauce, sesame oil , avocados or lime or onions. We tried poke from every place that we could from small shacks to high end restaurants to stalls from farmer’s markets and it was all equally superb! We also got a chance to eat the traditional Hawaiian luau meal (thanks to the conference organizers) and tasted poi, kalua (roasted pig), haupia (coconut based custard cubes), poke, lomi salmon and so on. Another delicious day was when we visited the local farmer’s market and tasted a lot of the fresh fruits – custard apples, sweet mangoes, rambutans and another Hawaiian specialty called Shave Ice – the Hawaiian version of gola but topped with fruits and nuts and sweet cream! We also ate at Merriman’s a high end restaurant in Big Island , Monstera (a hip noodle house), Three fat pigs (hello! Bacon!) and Ippy’s Hawaiian Barbecue where we had Loco Moco- a working man’s dinner consisted of a heap of rice and fries along with semi soft egg, hamburger and gravy – and yes it was as weird as it sounds!) . The food was delicious mainly because of fresh ingredients. Two niggling complaints were : the food within the resort was terrible. I was expecting overpriced meals but not overpriced AND terrible. The other thing was that for an island the amount of fish choices was really low – predominantly tuna, mahi mahi and salmon. I expected to taste some variety of fish that wasn’t common but that wasn’t to be. One question that a lot of people asked me was how was it traveling with the kids. It was surprisingly easy – at least in retrospect. We had to slow down our travels. If it was just us, we would have squeezed in a trip to Kauai for sure. There were more rest stops on drives , the ipads were used to keep budding tantrums at bay but the kids really did have fun. We were not too fussy about meals and sleep time – so they tended to sleep off when they wanted to , which was usually by early evening and woke up bright and early at 4 am , so we all kept early days and early nights! 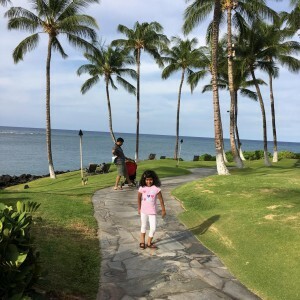 It was the first true vacation trip as a family of 4 – I think we can have a few more.